The Nigerian government likes to blow it's trumpet, by telling the world how they are the giant of Africa. Well apart from fraud and corruption, it is hard to find that sector that improves the lives of the people, if Nigeria is really a giant. Among international circles, Nigeria is ridiculously known as the the giant of Africa, which made every part of the world to have solid interest in doing business with her. However, it is fair to say that the economy of Nigeria which is what it is today, is because of the commercial acumen of Biafrans. That Nigeria attained to such gigantic height is because of Biafrans, that the name of Nigeria is being heard internationally is because of Biafran people who were attached in it. If you talk about the economy of Nigeria, you must also mention Biafrans because they are the ones making things to happen in Nigeria. The crude oil that is the saving grace of Nigeria is found in Biafraland. Biafrans are the ones mostly involved in importing and exporting goods and services. Biafrans are also the ones who take every risk to make sure that they engage themselves in all kinds of businesses while Hausa-Fulani parasites are champions in getting political power by all means so as to engage in squandermania and all kinds of corruption. Since the spirit of Biafra has left the evil enclave called Nigeria, every thing, I mean everything about her has collapsed and quenched like fire. Hausa Fulani and Yoruba's have nothing to contribute in the development and the economy of Nigeria because almost every thing that is making Nigeria great today are all from Biafra land. But in all these, Biafrans are not beneficiary to any instead they are been treated as slaves in the same country which they are being merged into. When the people of Biafra are still interested in the affair of Nigeria, every thing was moving smoothly in Nigeria but when they realized themselves and begin to withdraw themselves from certain activities of Nigeria, the falling of Nigeria began. This is to tell you that Biafrans are the ones holding the economy of Nigeria. I remembered those days when Nigeria used to celebrate her Independence, Biafrans all over the world will join in celebration alongside them, hoping that Nigeria is a place to live. Little did we know we were wallowing in self-delusion, dining with the devil. But since our eyes have been opened by the gospel of Nnamdi kanu, we are no longer interested in their so called independence not minding that our people like late Nnamdi Azikiwe and others were among the founding father's who fought relentlessly for the so called Nigeria independence. Again during the celebration of Nigeria independence, our people in Aba used to put up much efforts in other to make sure that they produced the Nigerian materials with the national colour (White and green) that people will use in celebrating the unfruitful independence. But today Aba people have totally boycotted that, showing that they are no longer interested in Nigeria and all these amounts to the falling of Nigeria. Activation of civil disobedience by Biafrans to Nigerian elections of any kind which is also in the Nigeria constitution is another thing that will bring Nigeria down completely. Let Hausa Fulani and Yoruba's keep voting because Nigeria and everything in it belongs to them, as for Biafrans, we are done!. What about Power generation? Giant with feet of clay and snow that can't provide her citizens with cheap and affordable energy. All the countries that got their electricity from Nigeria are generating more megawatts than Nigeria the source of their electricity. Is that not shameful? Of course it is . Most often, Nigeria goes by 0 megawatts in power generation whereas they supposed to be the one leading as far as electricity is concerned. 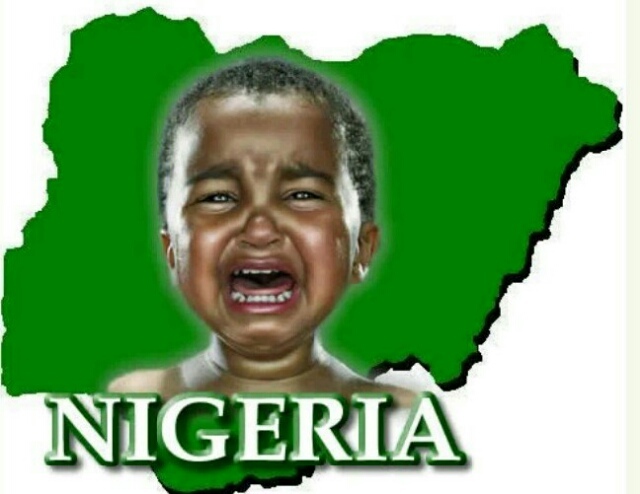 The economic recession borthering her has made some of her citizens to express regrets as to why they were born in Nigeria because Nigeria is only comparable to hellfire. Nigeria is a place where the rich gets richer and the poor gets poorer. The rich feeding on the blood and sweat of the poor people. Nigeria is a place where corruption is included in the constitution. Sleaze and all manner of swindling is perfectly legal in that fake country called Nigeria. Currently, the President of America, Donald Trump referred to Nigeria as a "gathering of people living in huts". A self-acclaimed "Giant of Africa" is now known in international circles as a society of huts. Little wonder when Nigerians emigrate to saner climes they find difficult to return back to their country. Nigeria is a country where aged people, who should be in retirement homes are still jostling for power while the youths, with fresh education, bright future and ideas are left behind. How can such a country not fail? Until they allow Biafra to go, nothing will ever work well again in that contraption called Nigeria. Until Biafra is being freed, Nigeria will continue to fail in all spheres of human capital development until it collapses under the weight of its own injustices and corruption. And out of its ashes will Biafra emerge. Oh! Giant of Africa with clay feet! Oh! Giant of fraud! Oh! Giant of corruption. Oh! ye paradise of unthinkable horror. Is that how you are gradually fizzling away from the surface of the earth? Is that how your history will be wiped out? Oh! Giant of Africa! Oh! ye Lugardian House of evil. Is this how you have fallen beyond repair? If so be, then Fall to rise no more.